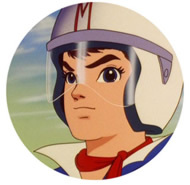 Forty years have passed since the cult-favorite Speed Racer began airing in US syndication. Two revival animated series were less than successful but there are high expectations for the upcoming big screen adaptation. To capitalize on the marketing of the live-action film, Speed is heading back to the small screen once again. In the new series, a young Speed enters an elite racing academy. Once there, he discovers that he’s the son of the original and legendary Speed Racer — and that he also has a brother, the new Racer X. The siblings work together to stop thieves from stealing the Mach 6 (an update of the original Mach 5 speedster) and to solve the disappearance of their father. The family ties continue with the senior Speed’s younger brother. Spritle is now the head of the racing academy and will be voiced by Peter Fernandez, the original U.S. voice of Speed. Spritle’s former monkey sidekick Chim-Chim will be a mechanical robot in the new show (not quite sure how that works). There’s been no mention of other original characters but I’d guess they’ll turn up. Lionsgate’s executive Ken Katsumoto says, “It seemed like the right time to do a revival. When this opportunity arose to revive such a classic property, we jumped.” Stay tuned! I have seen all da episodes. The best cartoon ever! So much better than that retard spongebob. Speed Racer: TNG RULES!!! People who don’t like it are crazy, TNG is almost better than the original series… almost. For those people judging the series strictly on it’s pilot episode, don’t. Top notch fans like me will tell you that the series gets better over time, and by the season 1 finale, It’ll have you glued to the edge of you’re seat. I love the show “speed racer: next gneration” I like to see several more seasons passed May2009. Is there any way this can work out?